CM: Imia is an unparalleled work by Giannis Stratis, which owes it uniqueness to the subject that inspired him - the Turkish invasion on the Greek Imia islets on 30 January 1996. The Greek dominion of Imia, which the Treaty of Paris conceded from Italy to Greece in 1947 during the merging of the Dodecanese, was disputed previously by the Turks already by December 1995. On 28 January 1996 a group of Turkish journalists of Hürriyet newspaper approached Imia on helicopter, lowered the Greek flag and raised the Turkish one in its place. This fact was the strongest violation of national integrity in Greek history in the period after the unlawful occupation of northern Cyprus in 1974. On 30 January the fleets of Greece and Turkey were positioned in battle formation in the broader area of Imia. The next day, on 31 January, the crew onboard the Greek helicopter - Lieutenants Panagiotis Vlahakos and Christodoulos Karathanasis and Chief Boatswain Hector Yalopsos - was sacrificed under unspecified conditions defending the Aegean Sea from the Turkish invaders. The 31st January 1996 belongs to the macabre pages in the history of the Greek Nation and Greeks ought to remember the heroes that were sacrificed that day and to pay tribute to them on every anniversary. In order to avoid escalation the agreement between Athens and Ankara , with the personal mediation of U.S. President Bill Clinton, was announced - for the Greek and Turkish forces to retreat evenly, with no flag claim over Imia. The news rapidly spread all over Greece, and the offended national feeling of the Greeks retreated unsatisfied in the name of peace. At the time of the Imia crisis Stratis was thirty-three years old. Irritated by the unjust Turkish act he threw himself on the floor of his home and created the present work directly on wood. He did not have something particular in mind, but he knew that he needed to express the indignation he felt as a Greek. He began his work by applying diluted color directly with his fingers. He used the blue as color of the sea and emblem of faith, and painted the portrait of Greece - a face rooted in archaic portraiture (peculiarly reminiscent of heads on either Kouri or Korae statues) calm in its readiness for action. This face represents every Greek who knows how to promote civilization and to resist injustice. He wrote in capital letters in red color at the top part of the work the date "TUESDAY 30/1/1996", the day in which Greece restrained the Turkish invasion. Under the date he wrote "GREECE" and across it "AEGEAN" underlined. He situated the islet with its surrounding sea on the face's lips and right above it, where anger is said to concentrate, he underlined its identity "IMIA". The work is characterized by a finely woven quality and transparent feeling like a gust, which awakens the artist's remembrance of the lost parts of the homeland. He used the yellow crocus color and inscribed successively: "Constantinople"; "Fanari"; "Alikarnassos"; "Smyrna"; "Cyprus"; "Ephesus"; and "Bosphorus". He inscribed "Constantinople" at the left and right temples of the face, in green the second time, to accentuate the area not only as the psychological birthplace of all Greeks, but as the seat of Orthodoxy. With Imia Stratis expressed his indignation, sadness, anger and rage for the continued limitation of his country's borders. This entire event's charge in combination with his roots as a Greek - as much in Smyrna as in Constantinople - came forth in the painting. This explains why the lips of his face are so tight. In the upper side opposite his country's name the face is crowned by the Greek flag stretched open. Becomingly Stratis comments: "Nothing is spared and nothing is won without battles". Giannis Stratis' Imia was conceded to The American College of Greece by Alex Marathianakis Down Town Art Gallery, Athens, on the day marking the 12th anniversary of their memory. 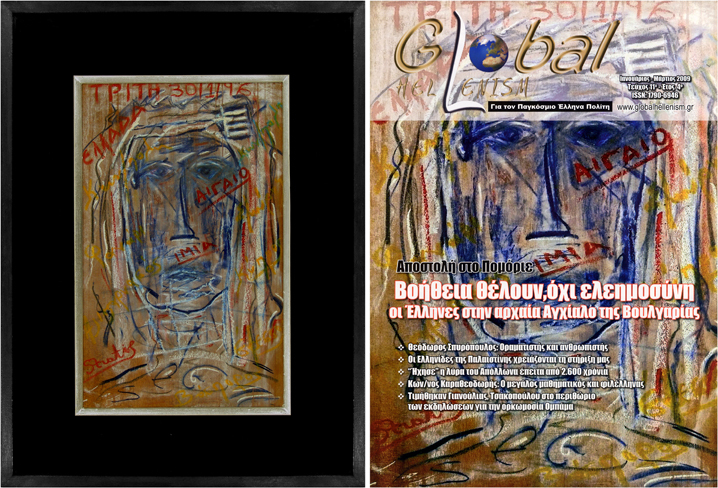 Stratis' Imia was also used to adorn the cover of 'Global Hellensim' magazine, the issue of January-March 2009 (herewith illustrated).